Meet Sarah, a young future Civil Engineer from Kajiado county who is a beneficiary of the Equity Wings To Fly program. I met Sarah at the 2016 commissioning for the same last week at Kasarani Stadium where the head of state commissioned 2,000 beneficiaries. 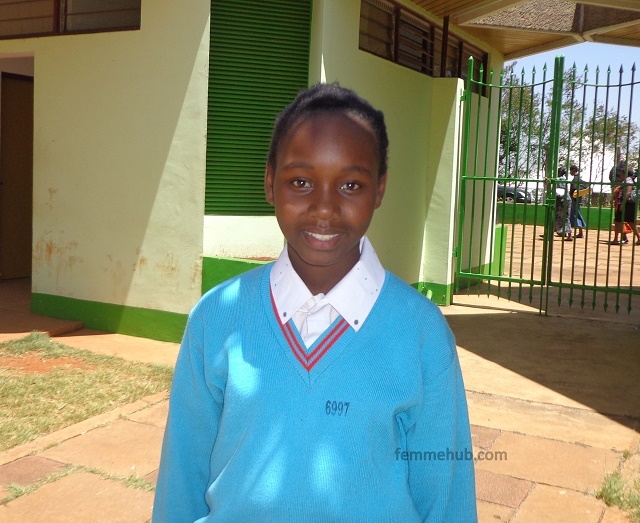 Sarah is in Karima Girls High School and is looking at a bright future but that was not always the case. Her fate changed from bleak to bright when she ran away from home where she was facing the threat of Female Genital Mutilation at the tender age of 9. She went to a local rescue centre and was later accepted by the Equity Wings to Fly program, through which she’s going through secondary school. Sarah would otherwise more than likely have ended up a child bride and never gotten a proper education. What’s more, her mother is now convinced about the downsides of FGM and early marriage and the upside of education and Sarah is 100% confident that her little sisters will be educated. Sarah is a first born in a family of 4. There were many other children like her at Kasarani. Their backgrounds are different but all with a common and sad thread of hopelessness and poverty. It was gratitude inducing for me to spend time with children who had otherwise been resigned to their fates of never amounting to much, and humbling to be present to bear witness as they were given wings to fly. A greenlight to dare to dream. And the dreams were big and in plenty! At a time when he should have been building his future in school, one young man was spending his days in quarries breaking stones with his mother just so they could afford breakfast. Another was spending his life at what he called ‘University of life in Lake Victoria’. He was just 11 when he became a fisherman. A young man from Kirinyaga was mining sand at Sagana river at just 15 years of age and as far as he was concerned, that was it. That was his destiny. A young girl was thrown out by her stepmother at the tender age of 6. She was rejected by her birth mother and she went to live with her aging grandmother. She hawked mandazi for 4 years before having her future taken over by the wings to fly program. What I noticed about all the children was that their chosen careers were all geared towards helping others in society, just like they had been helped. One wanted to be a doctor so as to eradicate cancer in the country. Her mother was diagnosed with cancer four years ago and as she watched it eat into her mum, she could also feel it eating into their family, into her education and ultimately into any prospects of a bright future for her. Sarah wants to be civil engineer so she can build the roads in her constituency to enable people to get to hospitals faster. One young man wants to study and become a great industrial chemist so as to transform the world of pharmaceuticals. Needy for cash but certainly not needy for brains and willpower, these children swore to extract gold from their books and make something of themselves. You could see the genuineness with which they resolved to live the Equity promise. A promise not to fail the organization, and not to fail society. The Equity Wings To Fly program which is in its 7th year is an initiative by Equity Bank and Mastercard foundation to see bright but needy children through the 4 years of Secondary School by offering not only tuition fees but also transport to and from school, pocket money, accommodation, shopping and uniform. As Equity’s Dr. Mwangi put it, Wings To Fly is not just a grant. It is a transformation of societies, uplifting of families and changing of dreams and destiny. And one can clearly see how. That is 2,000 more educated people who will in turn educate their children and their siblings. That is just this year and the program is in its 7th year. Dr. Mwangi hopes to push the number of beneficiaries to 20,000 a year. Do the math and see a transformed society.